We offer Sterling Silver, Sterling Overlay, Silver Plated and German Silver. Buckles can then be given an antique solution dip to bring the elements to light. Contains no silver but is a nickel alloy. This is a very hearty metal and will stand up to air and daily wear and tear. This metal can be engraved on and the finished product looks like a silver base. Is 92.5% pure silver blended with other metals to make it firmer and to help it hold its shape. Still it is the softest of the three types of trim. With exposure to air sterling will tarnish. 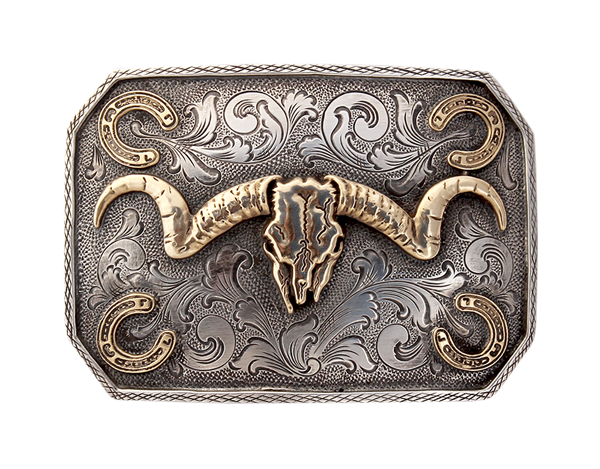 It is a thick layer of Sterling Silver laid on top of a firmer metal during the manufacturing process. This makes the finished piece firmer and less prone to bending. The silver is thick enough that it is engraved just like solid sterling and will also tarnish with exposure to air. Is a very thin layer of silver electroplated on to a thick piece of base metal. It cannot be engraved. The engraving you see on a silver plate trim is actually done on the metal underneath. The plate is so thin that you can still see the engraving. Please specify which finish you would like.